We very rarely have a full understanding of what it means, what it is, to be an animal of a different species. I have watched George, Jack, and Jane for over a year, and still have only a glimpse into their internal perspective. But we know that their experiences -- frustration or joy, attachment or rejection -- are uniquely meaningful to them. In that way, we are all the same. All different, but all equal. George follows the couple around everywhere, squawking when they squawk. But the moment he gets too close to the female, Jack lowers his head and bum rushes him. It's a painful sight to see for all of us who have dealt with the pain of rejection or inadequacy. And yet for an entire year, George has stuck around, waiting patiently for his moment of acceptance. I didn't realize until a few days ago, though, that George appears to be attached, not to Jane, but to... Jack. One day, Jack showed up without Jill by his side. I invariably worry when this happens. I wonder if Jane was hit by a car, or killed by a predator, or poisoned by some horrible chemical. But she almost always shows up shortly thereafter -- which happened in this case. But what was most striking was that, before Jane showed up, George followed.... Jack. 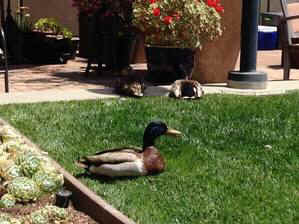 As Jack waddled around the courtyard, squawking and quacking as her normally does, George was close at his heel. And with no mate to defend, Jack was perfectly fine with this. The moral of the story? We very rarely have a full understanding of what it means, what it is, to be an animal of a different species. I have watched George, Jack, and Jane for over a year, and still have only a glimpse into their internal perspective. But we know that their experiences -- frustration or joy, attachment or rejection -- are uniquely meaningful to them. In that way, we are all the same. All different, but all equal.